Sliding Doors is one of those movies you are not quite prepared for when you read their synopsis. A couple of days ago, I partially watched this film again catching it accidentally on TV more than a decade after its initial release and I immediately remembered my pleasant surprise from the movie in the late 90's. At the time, after reading Sliding Doors synopsis, I expected a completely uninteresting and boring film but in fact I was wrong. Of course, it's possible that the lack of any hope for a good experience has been also important for my final appreciation of the movie. In an attempt to make another confusing synopsis, here is a brief summary of the movie. 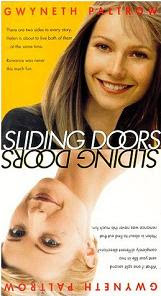 Sliding Doors is about a young woman who is just fired from her job. On her way home she tries to catch a subway train and from that point on, the movie forks. There are 2 parallel worlds: in one of them Helen (Gwyneth Paltrow) catches her lover Jerry (John Lynch) with another woman (Jeanne Tripplehorn) in their bed and she tries to change her life including dating another man James (John Hannah); in the other universe, Helen continues her existence unaware of Jerry's cheating and not making radical changes. It might sound not very interesting and honestly Sliding Doors is not a must see movie but if you approach it without any big expectations, chances are you'll find it entertaining. It's not the most realistic film but who would expect a believable movie given the premise above. There are enough funny moments to make you laugh and the use of various types of sliding doors throughout the movie adds to the experience. A smart decision of the moviemakers has been to present Helen with different hairstyles in both of the parallel worlds thus making it really easy to differentiate between them. The performances of the main characters in Sliding Doors are good although the screenplay does not offer the cast many opportunities to show extraordinary acting abilities. Gwyneth Paltrow plays both Helens convincingly and she is beautiful in both of her impersonations. John Hannah is charming as James and his Scottish accent is fascinating. There is real on-screen chemistry between Hannah and Paltrow. Jeanne Tripplehorn is a nice match for a seductive and possessive woman while John Lynch makes us to believe that Jerry really does not know what he wants. To be objective, Sliding Doors has its flaws. There is not much character development, the plot offers standard twists and solutions, and some of the events in the movie are probably more appropriate for a pure comedy or parody than for a film with elements of drama and romance. Nevertheless, I believe the main purpose of the movie has been to present an easily accessible and not too serious exploration of the completely various directions a single person's life could take depending on an almost insignificant everyday occurrence. If you've ever thought what it might have been if you've left your car home instead of driving to your work or whatever other "what if" comes to your mind, you are in a good position to appreciate Sliding Doors. Explore our maze of reviews to read more movie reviews.